Defiance Games adds to your terrain options with their new hard plastic Shipping Container pieces. Defiance Games is releasing hard plastic 28mm ISO shipping containers. 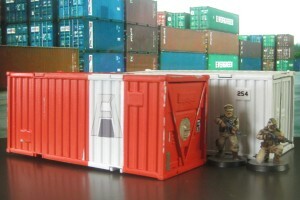 The hard plastic shipping containers are ideal for terrain and objectives on your gaming table. Each set features two containers - but you can build three different container options. One is a standard container, another is an enviro-unit/refrigerated container, and the third lets you have opening doors on both ends. A set with two containers is $29.95 - and we also have 4 and 10 set deals that will get you 8 or 20 containers! There is also a 50-container mega-deal for $499. You can literally fill your table! This last deal is for a limited time - until July 8th - the sets will ship the week of July 15th.